There are two types of schedule, which I’ll call the manager’s schedule and the maker’s schedule. The manager’s schedule is for bosses. It’s embodied in the traditional appointment book, with each day cut into one-hour intervals. You can block off several hours for a single task if you need to, but by default you change what you’re doing every hour. Completely true. When you are a developer, engineer, or architect (either software or real-world), by the time, you get around to understanding the problem at hand, and get the full perspective, its already a few hours, and if you have to head out to meetings at that time, the whole train of thought is lost, and you’ve go to restart again from pretty much the beginning. Last few months, I have had to be on both schedules, and its a very difficult thing to handle. On the one hand, I develop software that goes into our solution, and on the other hand, I have to follow up with all the other developers, interface with Sales and Operations, and all the other aspects of business. And in most cases, you can’t draw up a schedule and take out chunks of a few hours and concentrate on the development. As a result, in most cases, at one time, I can wear only one hat – either be a developer and ignore everything else, forget about making phone calls, following up with people etc., and concentrate on writing code. At other times, there are complete days where I can’t afford to even open my IDE because I am wearing the managers hat and do all the other things I have been ignoring all the while. It also leads to a complete state of confusion at times when you change hats too frequently – and at those times, you know you’re losing it and its best to forget everything and take a break. It’s a difficult balancing act – identify what requires your most immediate attention, and change hats frequently, so that collectively the whole organization is most productive, even if you feel that you are not at your most productive level yourself. However, even though we may hate it, the way most of us (and with us I mean people who are never satisfied, and keep pushing ahead for more) we love it most when we have too much to do, rather than too little. Changing hats rapidly, probably take a hit on personal productivity, re-engineering yourself with the dynamics of the environment around you, basically going crazy, are a part of the job description, something you learn to hate – but do nevertheless – and grow along the way. Thus begins Amit Varma’s (of India Uncut fame) newest yellowback My Friend Sancho (follow this link for the Author’s homepage on the book, or the Facebook fan page). Abir, or Abeeeer as he is called by friends in a state of bacchanalia, relishes a full meal of online games everyday, and then passes obnoxious PJs, enjoys being at Bookends a bookshop in Bombay’s Eterniti mall (good nomenclature!) and covers the crime beat in Bombay when he feels like doing any work. Abir is imaginative, wildly, his hormones getting the better of him at the drop of every pen anywhere in the world, his testosterone-tinted glasses seeing through every fabric. He is a witness to a murder and then finds himself in love with the daughter of the victim, Muneeza aka Sancho, when he is pushed into an assignment to sketch her father’s life. 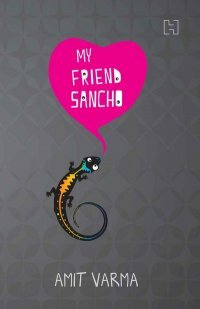 The story is about how Abir’s life gets entangled with Sancho’s, doesn’t have the balls to tell her the truth, and when he does, as is usually the case he is spurned, and finds himself in the state of abject despair (of course, since its despair in love!). The fact that his room-mate lizard is in no mood to empathize doesn’t help either. What happens in the end … umm .. read the book! The best thing about the book is that its a very light read, very quick — I finished it off in two sittings. To the credit of the book, it managed to hold my interest even as I kept watching the results of the nations greatest jamboree, the Lok Sabha elections 2009. As you navigate from one wisecrack to another, you wonder if Varma was under the influence of err .. something more influential that lends to more fluent thoughts (a la Coleridge in Kubla Khan?) — you wonder if the wry sense of humour can be achieved in sobriety. The plot is tight, quick — though the book is more in the prose than the plot. I remember the last book I had read with an equal gleeful page-turning urgency was The Inscrutable Americans, and I hope this book reaches the same heights of success! Of course, the best fleshed out character in the book is the Lizard. I don’t think you can find another book where a Lizard emotes quite as much. One Journey ends. Another Begins. —and I give up all claims to my house. I only ask for last kind words from you. but I received more than I could give. and the lamp that lit my dark corner is out. A summons has come and I am ready for my journey. So, I have been feeling low for awhile and I figured that the single biggest thing I miss right now is the feeling of Durga Puja. Having grown up in laid back Calcutta, with a heavy dose of vacations and dollops of Pujo during this season. Have had my share of fun in the Navratri — from getting sloshed to fun dandiya nights. However, it still doesn’t feel complete. Somehow, there is a large missing entity in the equation, and things just don’t add equally up on both sides. I think what separates Calcutta during this time from the rest of the country is that Puja is just not a festival you enjoy, not just another set of rituals you observe, not just a holiday you chill out on, not just old relatives you don’t meet the rest of the year — Puja is a way of life. It’s all pervasive — it’s in the air, the crowded streets, the blaring music, the glittering lights, the all-night food stalls selling egg chow-mein, in the new clothes, bedecked women, and kurta-clad men, in the silent corridors of power and the menagerie therein, in the adda sessions and the ogling and the swooning, in the temples and outside, in the priest and even the atheist (holiday, after all! ), in the closed offices and annual bonuses, in the pandals and new-yet-worn-out sandals, in anticipation of new things and frustrations of those over-used, in the sparkle of people’s eyes, in their troubles and smiles. It’s just one heady feeling — when the world around you is caught in a time-warp, when nothing else matters but Puja. I am guessing I am missing that feeling right now. There is fun and there is work and both might overlap, but there is no single event that completely captures all your imagination, your thinking, your whole existence for a period of four days. It’s like being in love just enough. Over the last couple of days, I wrote new posts on both of my other blogs — Some Observations on Social Networking, mainly inspired from an article by Chris Anderson, and a reproduction of a poetry in Hindi by Harivansh Rai Bachchan — Kshar Bhar ko Kyun Pyaar Kiya Tha?